Here it is, laid out in blue and orange: A map of all the places in this country where folks with pit bulls are best to avoid. This is a screenshot of the BSL Census map, so it's non-interactive. On the BSL Census website itself, clicking on a state brings you to a page listing all the instances of BSL in that state. Diaz and Van Zant are asking for help from people who know of instances of BSL, or changes in the law, that aren't now accounted for on their site. 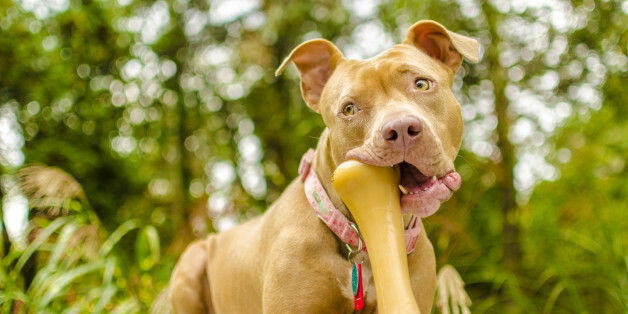 BSL stands for breed-specific legislation -- laws and regulations, enacted at the city or county level, that ban or restrict the keeping of dogs by breed, typically targeting pit bulls. Dogs like Rottweilers, Dobermans and chows are also frequently also affected by the laws. "On one hand, it shows people how big the problem of BSL is," says Ronnie Van Zant, a dog trainer and founder of the group Pit Bull Advocates of the United States, who is one of two researchers who have spent the past two years putting together the BSL Census. "On the other hand, it can be daunting to look at this map and see how many people are affected by BSL, and get overwhelmed and feel as if there isn’t anything they can do to really fight it, since it is such a huge problem," Van Zant says. "We know otherwise though, so through our effort to provide them with the most detailed database of BSL out there we are also providing them with the ways they can help in their own communities to educate and fight against existing or proposed BSL." Van Zant and Kris Diaz, who keeps a blog called Stop BSL, say they hope their project will not only help families know where they aren't welcome, but will also light a fire under dog lovers who want to get political, by showing where such efforts are needed. "This map keeps people safe and the public educated," says Van Zant. There's reason for optimism. Pit bulls have become more visible as therapy dogs, police dogs and even plain old goofy pets no different from other dogs, except in how they're treated (including their depressingly high euthanasia rate in shelters). Because the BSL Census tracks a rapidly changing landscape -- communities week by week are reconsidering and scrapping these laws in favor of breed-neutral dog regulations -- Diaz and Van Zant are asking folks to get in touch if they know about any laws their project is missing. "If they can provide a copy of the ordinance as well, that would be fabulous. One of the hardest parts of this is contacting small towns to get an actual copy of the law," says Diaz. The hope, of course, is that, in not too much time, the map will be filled with massive patches of green, representing a country in which well-behaved dogs of all varieties are welcome with open arms (and maybe a biscuit or two, but let's not too greedy). Yes, the two people who've spent the past two years making this map are hoping their hard work soon becomes obsolete. "I have been tracking BSL for some time now and I can say with an absolute certainty that the tide is turning," says Diaz. "The science is better, our understanding of canine behavior is better and common sense is prevailing. It may seem at times that is not the case, but when we are able to go back and take stock each year, it is clear. The BSL Census will be a visceral reminder of this, as we see the lists shrink year by year."